It is productive from year 3 in ground. I have kept it at 8-9 ft. If I had let it grow, the yield would be a lot more but I’d not be abke to pick many of those pears . Also have you ever had spiced crabapples? I would use the same recipe for your Asian pears! They would be delicious too. Will see if my head chef would agree to do it. A pears seem to contianna lot more water tgan E pears. Once Drippin Honey are mature the pears keep a really long time in storage. 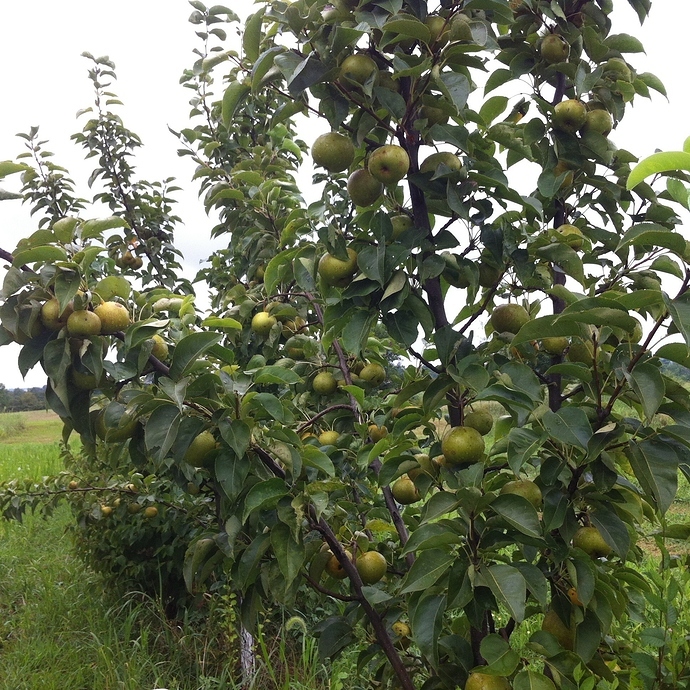 The trees need to be mature for the pears to be at their best. That’s good to know, my Drippin’ Honey have only been fruiting for a couple of years, so it’s delightful to know they will only get better. 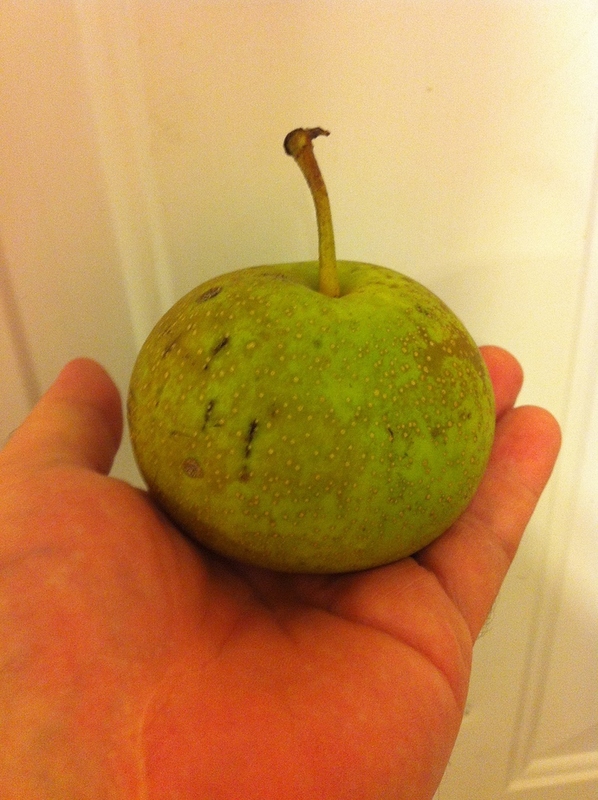 So far, it’s my most anticipated Asian pear variety to ripen. I think it is also the earliest, at least, of the cultivars I have. Yes Drippin Honey is very early. 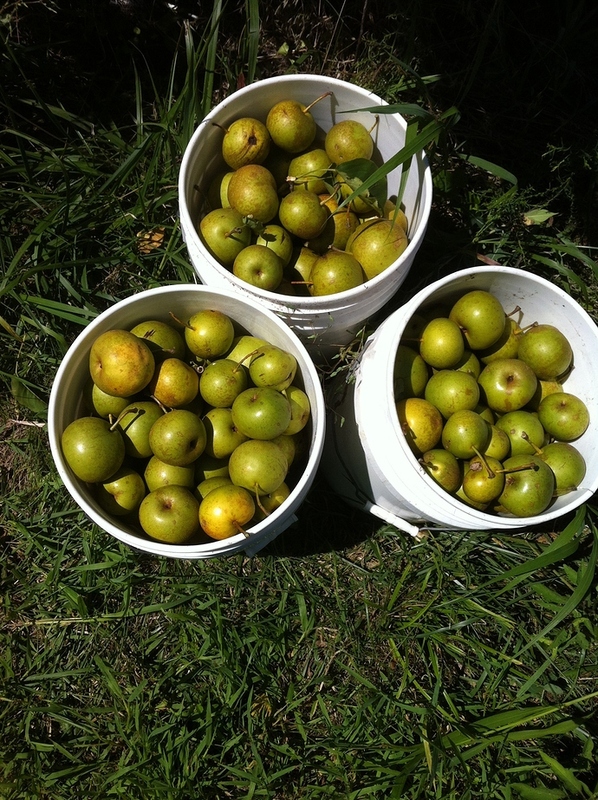 Some years that means ripe fruit in July in Kansas. it’s fruit are at the peak of flavor about 3 years after they start producing fruit. People who have tried them will call before they are ripe asking if they are ready. Korean Giant are a good fall pear though it’s like comparing apples and oranges because they are very different tasting fruits. Both are similar size and very tasty in very different ways. They are both very sugary and refreshing. The chojuro @39thparallel grows are butterscotch flavored and really delicious fruit. Yali were suggested by @tonyOmahaz5 and are very refreshing but the most different pear I’ve had. So many great fruits to try! We all have our favorite. 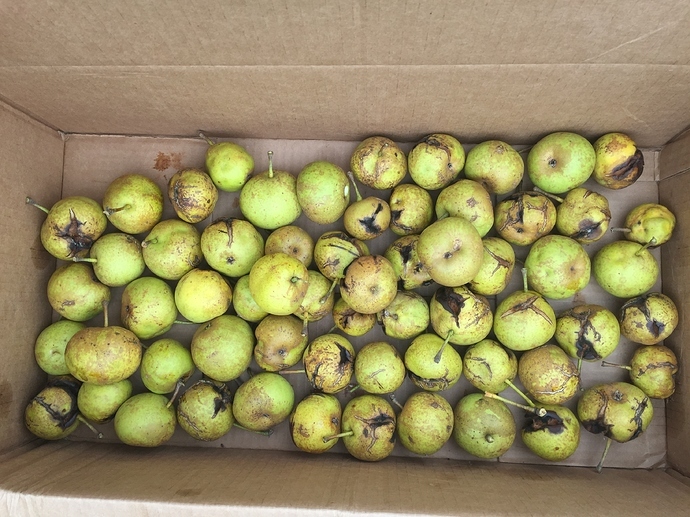 My Asian pears harvest did not go well this year. I got stink bug problem and yellow wasp problem. I have about 10+ varieties now. 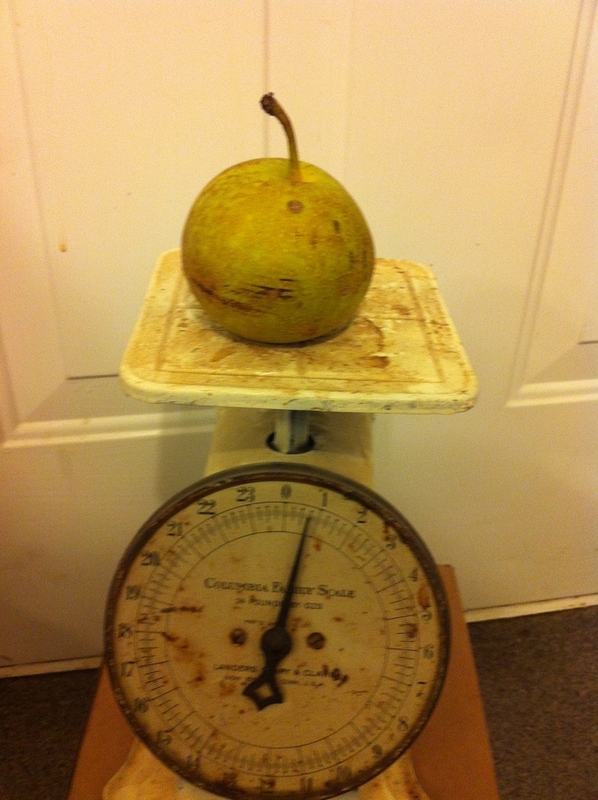 I think KG is more reliable , large size, nice sweet flavor among Asian pear I have, and it keeps well. Drippin honey is smaller than KG but ripe earlier than KG. 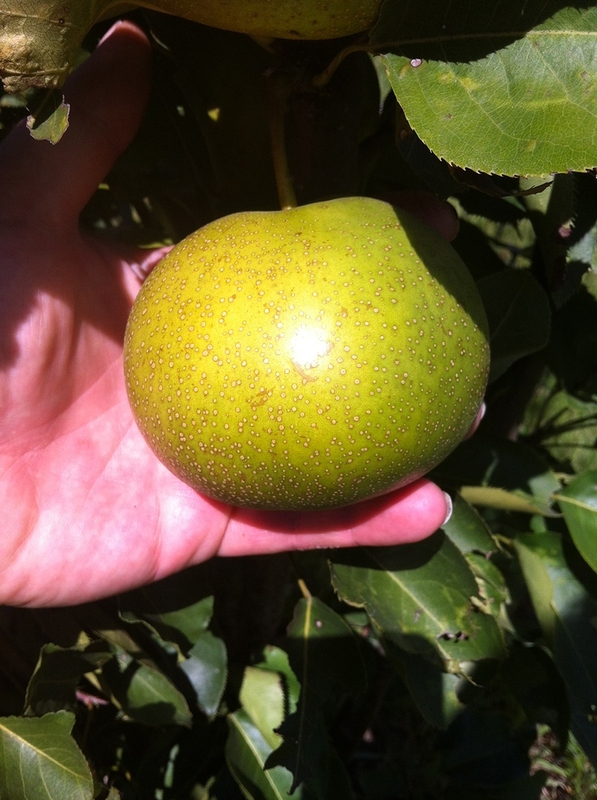 The most exciting Asian pear I grafted is LaiYang Li, a very famous pear named after the city where it was discovered from ShanDong province in China. It is very juicy, tender, mild sweet, thick skin and have long storage time. Korean Giant is still a fairly new pear to me so I’ve not seen its full potential yet. I do like what I see! It weighs around a pound like Drippin Honey. If Drippin Honey is not thinned the fruit will be smaller but it produces lots of it. Here is a picture of my largest Korean Giant this year. The pictures below are of my Drippin Honey trees because I don’t want people to get the wrong idea and think that it’s not as good as Korean Giant. It’s biggest draw back is in places that get summer rains it will crack badly. They have cracked this bad just 1 year for me out of the many many years I’ve grown them. It’s not unusual to get a few cracks but this year we had the worse drought since the 1930’s and then it rained so I’m not expecting these conditions again but it could happen again like this year. My concern is some locations may get heavy rains in July and August normally and this would be a bad pear for them to grow. 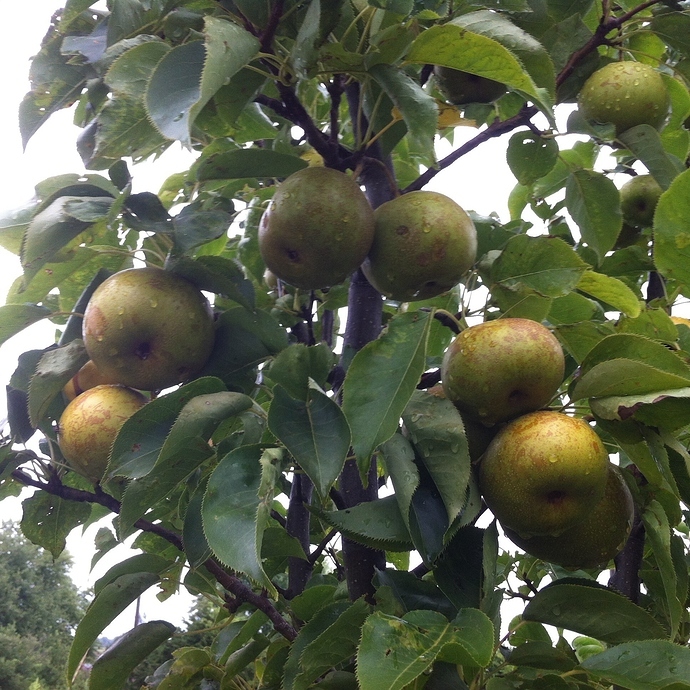 I have always thinned my fruit heavily to improve size and taste and to avoid branch breaking. I thinned thousands of KG off in3-4 rounds at the beginning of the season. Unfortunately, many of my KG harvest this year are rather smaller. Very disappointing. I feel like a hypocrite. In the past I had KG that weighed a lb or more. 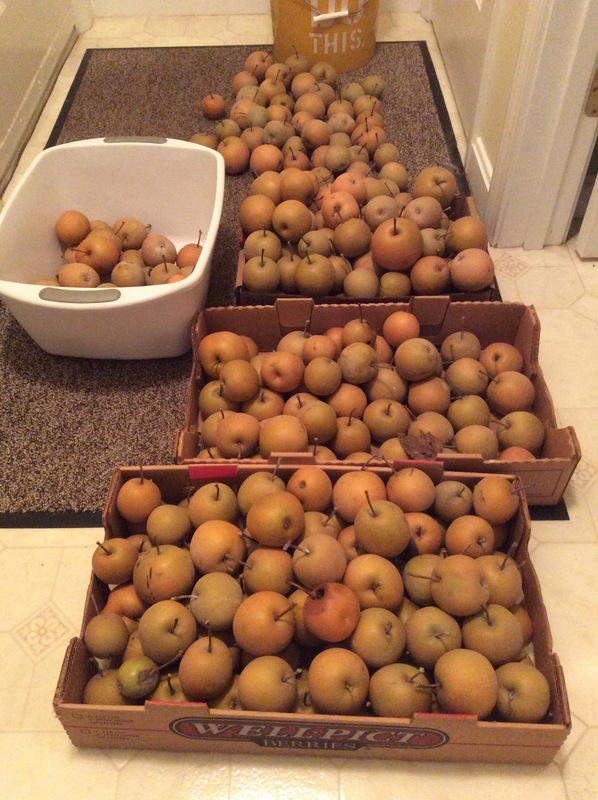 Clark， you got a lot of pears. l agree that DH is very productive, can grow a lot of fruits. It needs to be thinned to make up the fruit size. In my climate, I haven’t seen crack issue on drippin honey . Compare DH with KG, I think KG flash is dense , or little harder to take a bite.DH is tender and juicy. KG is larger, typically around 11/2. lb each, some are near 2 lb each.but I have not yet seen DH grow near to that size. Great looking pears! For some reason some years pears just don’t reach their normal size. My duchess were smaller than normal this year. Yes 1 pound is max for Drippin Honey. Those Korean Giant you grow are extremely large pears! 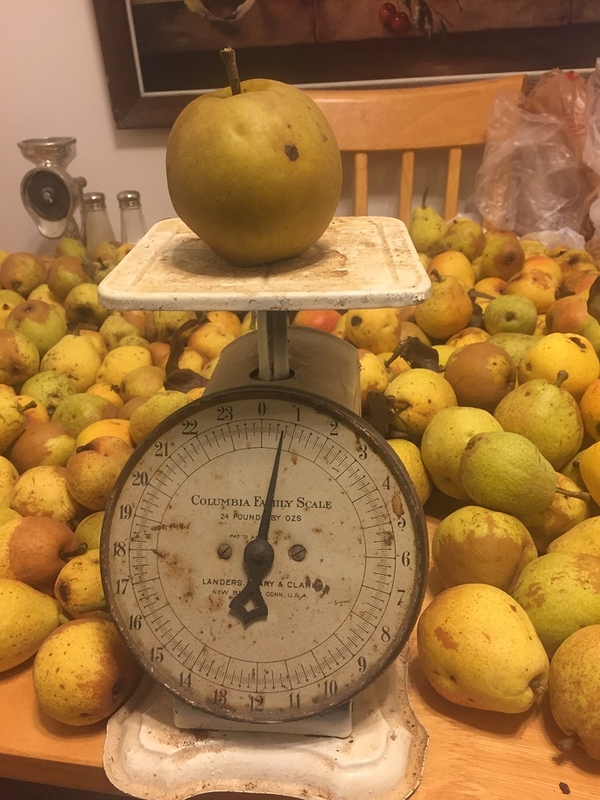 Had no idea they could reach 2 pounds because they are still a new pear to me. I feel kind of like I’m comparing gold with platinum and feel fortunate to have either fruit but very blessed to have both. They are both excellent fruits! 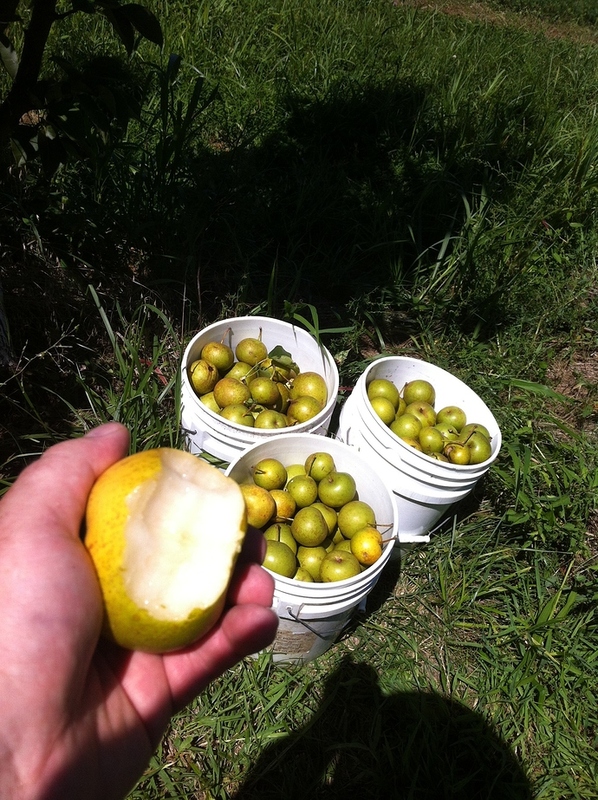 The ripening seasons compliment each other to with DH being early and KG late as mentioned. The assessment of KG you gave as being harder and more dense is very accurate. Both pears I would say are really exceptional when compared with others. 2 lb for KG!!! I’ve never known that they could be that big. I will try to achieve that next year. Thanks for letting us know. Hello everyone! Any one knows any info about varieties Hayatama, Kumoi, Niitaka, Shinsui and Tama? Thank’s! I’m sorry those are not varities I’m familiar with. Shingo. Korean Shingo is a seedlings of niitake. The fruits of Korean shingo is close to the description of niitake. 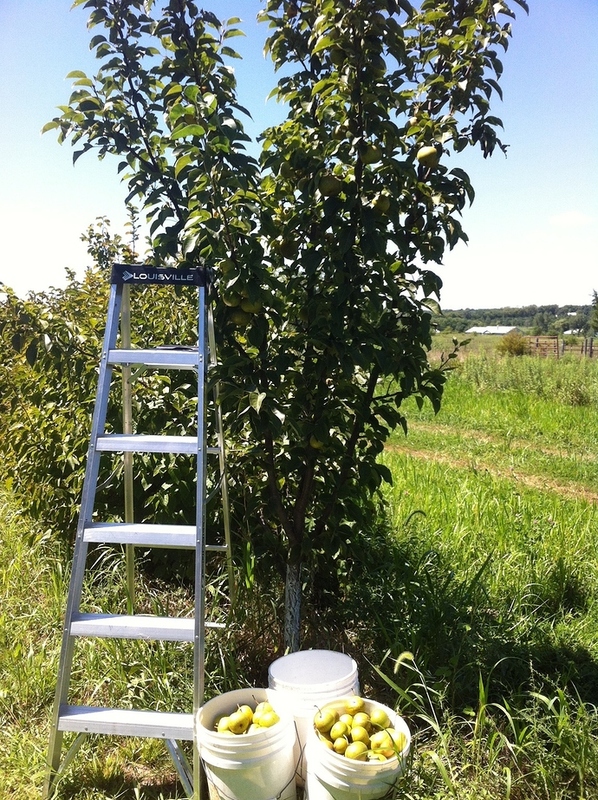 Shinsui is a comparably early Asian pear, probably in early Aug. I tasted some fruits from my friend’s orchards. Russet, round, crunchy, and very sweet. A good choice for the season. I am not familiar with the other three. 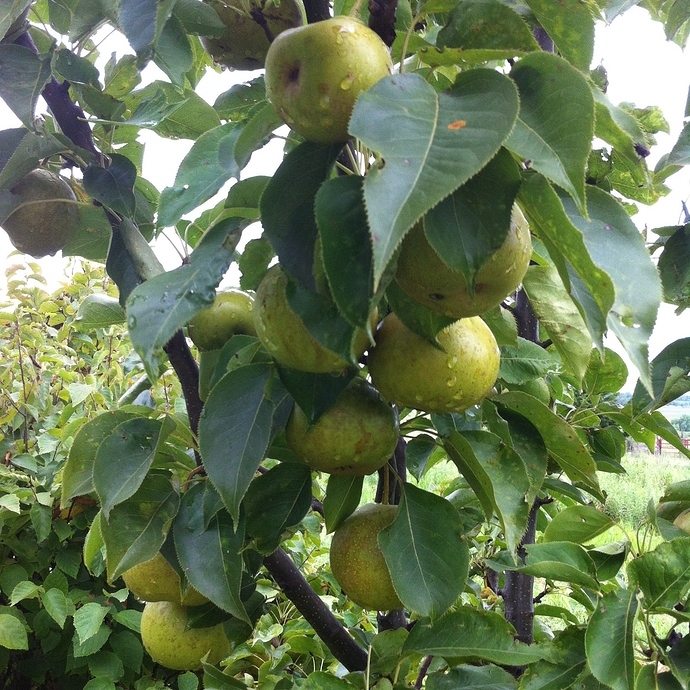 I am looking for Ichiban Nashi pear scions. Anyone has it. A short scionwood with a few buds should work for me. If you have any of above, I have Yulu Fragrant pear for swap. Updated. A nice fellow here has a few varieties in the above list and will swap with me. Chojuro, Korean Giant, and Drippin Honey all appear to be considered must have varieties in many different climates. Might any other varieties be that good in a large variety of climates?